This volume examines the tragic role Christians have played in the persecution of Jews for centuries. You hold in your hands shocking information which has been omitted from most Christian history books. This volume examines the tragic role Christians have played in the persecution of Jews for centuries. Most Christians are unaware of this bloody stain on the church’s legacy. How and why did the church persecute the Jewish people with demonic hatred in the name of Christ? Merrill Bolender’s important work answers this question by providing historical documentation that readers are not likely to hear in the average pulpit or seminary. 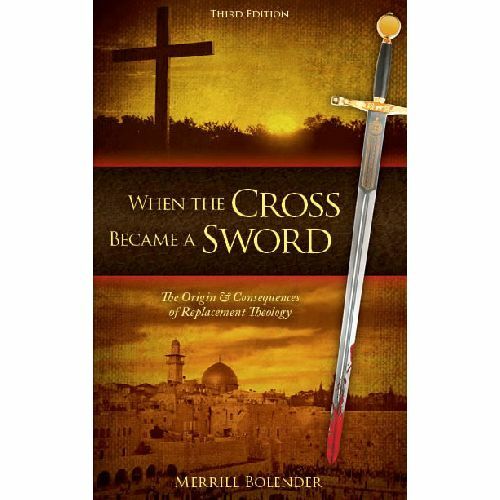 Merrill identifies the theological error of replacement theology and shows how this unbiblical teaching played a key role in the slaughter of countless Jews during the crusades, inquisitions, pogroms, and even the Holocaust. The cross-a symbol of God’s love-literally became a sword. The church must understand the Jewish people’s prophetic role in the unfolding redemptive purposes of God in these last days. The Body of Christ must learn, understand and rightly apply the Scriptures relating to God’s covenantal plans for the land of Israel and His chosen people. Will the church harden its heart and repeat the same mistakes of the past? Or will she learn from her errors, recognize sin, and repent? Only by repenting will the church experience the healing, restoration, and reconciliation that God desires – for Israel and the church.